Every morning at 7:30 AM, tools in hand, Max, Bastien, Pascal and their chief, Mahican, head out on the trails of the Parc d’environnement naturel de Sutton (PENS). They climb the mountain every morning to go to work. 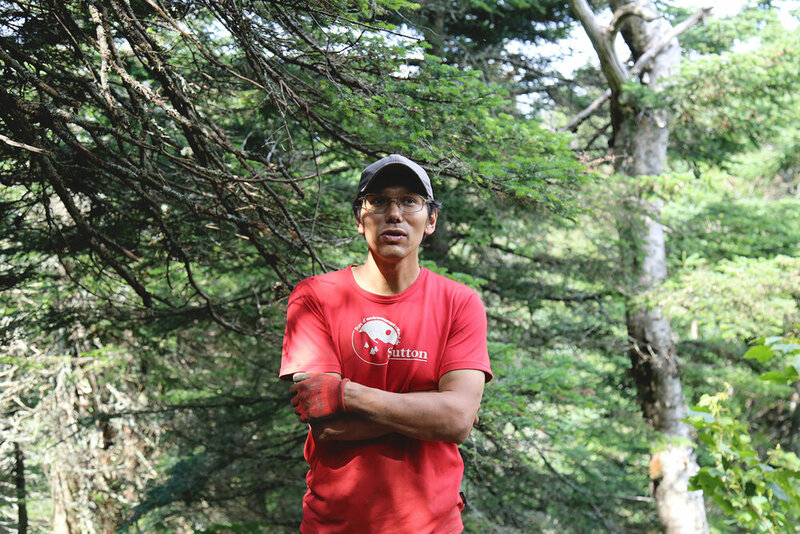 This is their mission: to maintain the 52 kilometers of trails, which remain accessible all year round. Four summits, two lakes, two ponds and numerous breathtaking view points make up the setting in which these workers labour every day so that the trails and precious scenery might stay accessible to hikers. The work undertaken by the PENS' developers, i.e. twelve or so employees, is colossal. Because tractors and machinery cannot climb the trails, the shaping is done entirely by hand or with tools that are carried up and which must be brought down at the end of every day. The work consists of removing the living forest floor in order to reach the mineral layer and then to build the trail out of beaten earth. The developers however, do not only act as lumberjacks, they also carry out other tasks including breaking rocks and moving them using a lever, some of the rocks can weigh up to 500 pounds. Another big part of their work is to set up alternate trails and bypass roads in places where the ground has eroded. The cause of erosion is not necessarily human; water is the main culprit. While summer thunderstorms transport sediment, melting snow in the springtime often damages the trails. Furthermore, in light of global climate change, the trails are being damaged even more rapidly. Thus, trail shaping must be thought over in a sustainable manner by Mahican and the team in order to avoid further erosion. The PENS was founded in 1979 by a group of passionate individuals who believed that granting access to nature was key in order to protect it. The PENS is also a member of the Appalachian Corridor, a non-profit conservation group whose mission it is to protect the natural environment of the Appalachian region. Furthermore, the PENS was also able to exist thanks to several private property owners from Sutton who granted access to their land. Mr. Kivenko, for example, a resident of the town, gave access to his land so that there might be a trailhead directly in the village that links up to the Parc access situated at altitude 520 meters up the mountain. It is therefore thanks to the teamwork between the villagers, the workers and the numerous volunteers that the PENS can continue their mission. Think about that during your next hike!